Safety & compliance training is required by law, but it can have a greater purpose besides simply meeting a requirement. What if your employees need to evacuate a building? Or what if a vial of contaminated blood is dropped in the lab? In both of these situations, employees will need to know the proper process to follow and start following it almost immediately. Effective training can help employees protect themselves—and it also protects the organization from harm. Training that is needed to comply with an internal company policy can be just as important. Cybersecurity is a hot topic right now because many companies cannot get their employees to consistently follow procedures to secure their data. Could training help prevent these security breaches? In some situations, yes. Unfortunately, safety & compliance training is often viewed as just another “expense.” Organizations know they have to do it, but they are not willing to invest budget and resources needed to make the training effective. Other times, there is plenty of budget, but it is being invested in instructor-led, synchronous training that is expensive and hard to sustain. An engaging eLearning course can actually save money, especially if it is instructionally sound and helps employees reduce accidents. eLearning has become the preferred delivery method for safety & compliance training because it is easy to track completion… but it’s not always the right choice for your learners. If they do not have access for a computer or mobile device in their role, an instructor-led solution may be needed. And what exactly should an eLearning course include that teaches safety procedures? Should you use illustrations, photography, video, a combination? Will your learners respond well to a gamified course? What level of multimedia is truly needed to teach, and what would simply be over the top? We’ve created dozens of safety & compliance learning solutions for Fortune 500 clients in our 20 years as a company. Sometimes a facilitated workshop is needed. Other times, we’ve created a gamified eLearning course for a key safety topic. To reduce costs, we’ve designed safety curriculums and created the first few courses then provided the client with templates and a style guide for their internal team to continue development. The possibilities are endless. 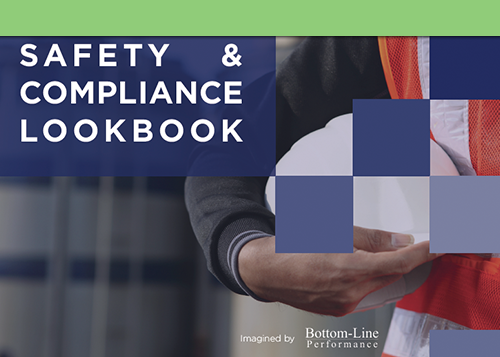 Our Safety & Compliance Lookbook includes 17 of our favorite safety & compliance samples, all organized by topic and approach. Use it to decide what type of training to use at your organization for each topic.